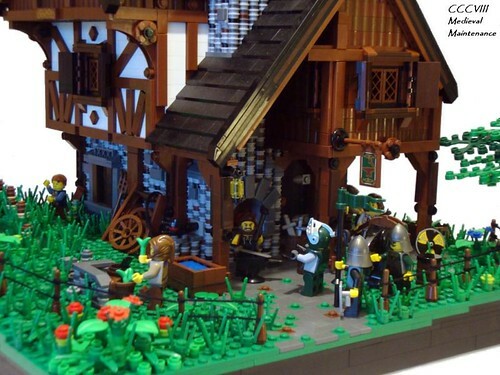 Jason and I are both big fans of the Medieval Market set, and a friend who knows this passed this neat MOC along. It was posted a few weeks ago on flickr, and is from “Derfel Cadarn”. 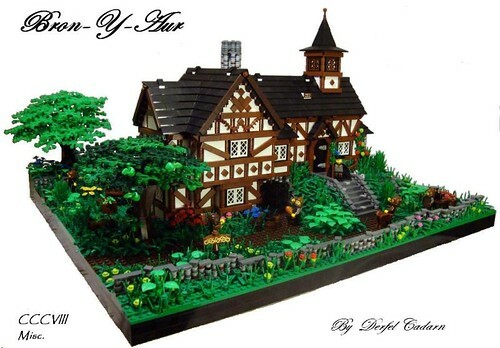 It’s titled “Ye Olde Forge”, and is focused around a minifig-scaled blacksmith’s shop, and is part of a contest hosted by Classic-Castle.com. It’s in the “Medieval Maintenance” category (see links below for more information). I’ve always wanted to build a blacksmith’s shop, and I figured if I do then I’m gonna build it big and full of detail. The most most common mistake( and I’m a victim of this too), is building houses that look like they haven’t got enough room for a minifig to even lay down! I’m quite happy with how this has turned out, but there’s still things I wish I had changed. If you’d like to see some of the other entries, head over to Classic-Castle.com’s Colossal Castle Contest VIII. The contest runs through December 31, 2010, so there’s actually still time for you to enter, and some of the prizes include castle sets from the 1980s and 1990s! This originally started off as part 3 of Myths & Legends, but half way through the build I wasn’t happy with the design and decided to start again. But before I ripped the model apart, I neatened it up finished the house so I could use it in the CCC. At least it has some use now, other then that, its just a failed design that didnt make it to Myths & Legends.